Lynn Hung (熊黛林) has confirmed that she has already registered for marriage with boyfriend Kwok Ho-chung (郭可頌), younger brother of actress Kenix Kwok (郭可盈). 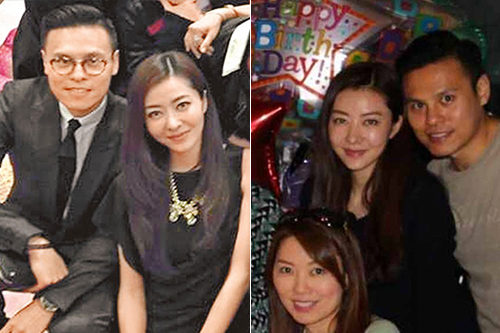 Lynn, who broke up with Aaron Kwok (郭富城) in 2013, was discovered to be in a relationship with Ho-chung when paps spotted the couple having dinner back in late 2014. Lynn subsequently confirmed the reports. The 35-year-old actress-model shared in March of this year that her boyfriend had proposed to her with a 3 carat ring. There were rumors at the time that they would be holding a wedding in December, but Lynn said their wedding plans were postponed due to work. Earlier this week, a reporter discovered that Lynn and Ho-chung had turned in paperwork for their intended marriage in early September. In their marriage certificate, both Lynn and Ho-chung specified that they are already living together. This will be Ho-chung’s second marriage. He and his ex-wife had an amicable divorce back in 2013. Congratulations to Lynn and Ho-chung! lucky woman…from one kwok to another.